You know how sometimes when you’re learning you have a breakthrough and suddenly something that was once black magic comes into crystal clear focus and is no longer this mysterious monster that you thought you’d never understand? My boat has a 90hp Ford Lehman diesel engine. Until this week, I knew very little about diesel engines. 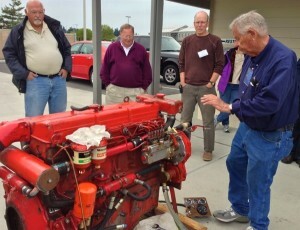 Several months ago, I’d heard rumors that the “architect” of my engine, Bob Smith, gave training workshops a few times a year, so I searched around and found that the next one was in Anacortes, Washington at a TrawlerFest, put on by Passagemaker Magazine. I cashed in some sky miles and signed up for the workshop. I’d never heard of Anacortes before, but it was a very quaint little boating town with some incredible seafood restaurants. Anyway, I’d thumbed through “How to maintain your diesel engine” type books before, but Bob Smith’s Diesel Workshop was incredible. Bob left Lehman years ago and opened his own shop, the American Diesel Corp, that sells all the parts & services necessary to keep Lehman diesels around the world running. This guy knows his stuff, and it was a privilege to be able to spend 2 days learning as much as possible about my engine. We spent Day 1 going around the room meeting the 16 people in the class and discussing any engine problems we’d had. We covered the theory of how diesels work and what symptoms are caused by what problems. Day 2 was spent breaking & fixing a real life engine. We pulled out the injectors, timed the valves & did several other things that sounded like greek to me before this week. My first instinct when something is wrong with the engine is to call a professional. Now I think that’ll change. Don’t get me wrong…an experienced mechanic I am not. But I now have the confidence to know that if things went crazy & I was in the middle of the ocean, I could more than likely figure it out. That’s a good feeling to have. This is just another baby step to get me closer to #31 on the list. I recently purchased a steel Roberts 44 built in Bellingham, WA with a 2711e Lehman Marine. I have been working on restoring the boat. I have been trying to get more information about Bob Smith & American Diesel Corp. When I go to their website I find no contact info or email address. Can you help me? My search has just begun. I live down the road from Anacortes and would have loved to have attended that workshop. My next stop is Passagemaker.